All proceedings reinvested in research!! 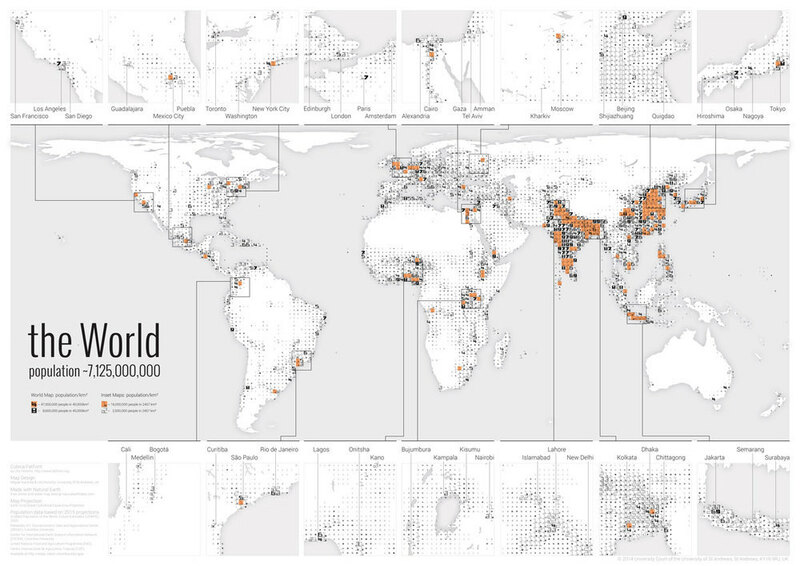 The map shows how the population of the world is distributed. It uses a typographic visualization technique – FatFonts –which allows you to read the exact number of people living in a particular area with a precision within 100,000 people. Each number in the world map corresponds to the population in an area of approx. 40,000 km². A blog post by Miguel, with some personal comments. A description of the map in the SACHI Blog. In his article, Ortiz sets out to “find all possible ways to visualize a small data set of two numbers”. He ends up exploring 45 visual representations – FatFonts is one of them (#45). The article stimulates an interesting discussion about scalability, context and possibilities to combine different visual representations. FatFonts have been featured in the Calgary Herald and, a bit earlier, on UofC today. FatFonts have been featured on Wired.co.uk. FatFonts are featured on FastCompany’s blog on business + innovation + design. FatFonts are featured on Calculated Images, a blog by Richard Wheeler, who helped us convert some of our FatFont types into regular font files. Thanks again, Richard! FatFonts are featured on infosthetics.com, Andrew Vande Moere’s blog on information aesthetics. With the help of Richard Wheeler, we have created regular FatFont font files that you can install on your computer. Please, check the new downloads page, and the instructions on how to use them. 0 Comments, Tags: Downloads, FatFonts, Open Type format, True Type formats. FatFonts has been featured in the New Scientist (Issue 2863)! 0 Comments, Tags: New Scientist.